An essential element of PR planning involves research. Primary and secondary sources of information are helpful in setting benchmarks for PR plans in order to effectively evaluate the success of your PR efforts. When evaluating products or services or even new ideas, a new business trend dubbed “crowdsourcing” has appeared. A cross between brainstorming and croudsourcing, it is a new method of quickly testing ideas with a large number of people. Consider this article about crowdsourcing. The authors claim that this new method is the future of innovation, ideas and problem solving. In their recent book, Crowdstorm, they lay out a compelling case for getting advice from the smartest people in the crowd. It’s worth a look. Crowdsourcing of course can’t always be applied to every aspect of a product’s development, but when it can it appears to be an extremely effective tool. I recall the first time I heard about a crowdsourcing campaign and participated. It was 2008 or 2009, Ben and Jerry’s launched a “Do The World A Flavor” campaign to crowdsource a new flavor of ice-cream. There was a microsite where users could pick from a selection of fair trade ingredients (which, when hovered over, revealed sourcing details) and then submit their ice-cream concoction, whilst the web application also offered the chance to share the suggested flavor with friends on Facebook. In addition to placing the winning combination of ingredients into production, Ben and Jerry’s also gave users the chance to win a trip to a fair trade cocoa farm in the Dominican Republic. I didn’t win, but I remember following the different flavors being submitted and there were over 80,000! Crowdstorming is certainly and interesting concept. The idea of crowdsourcing has been around a relatively long time. Some of the most common are the the form of company sponsored forums for applications such as the Microsoft Office Suite products, even some of the help files. Apple even has an online trouble shooting forum. While I like the idea, from a risk perspective I think there is quite a bit of risk involved in crowdstorming. I would be leery about putting too much information out to the masses in fear of loosing a competitive edge or being able to be first to market. If ideas are just being refined or things like color or wording, it’s probably a bit less risky. I think the idea holds a lot more weight for less strategically significant items. I like the idea of crowdstorming in that it gives you a large number of feedback. Although it makes deciding what part of that feedback is valuable and applicable a little bit harder. I think the biggest advantage is that it makes the consumer feel involved. The article states, “It provides a way to build a community. Giving people an important role to help an organization make decisions can build a community of advocates.” Having a community is important because it gives you a following. I think the downside of such a large group is you have limited follow-through. With a smaller focus you can get the inputs of the group through the brainstorming and the after product. I also really like that Kenny pointed out that with such an open forum you risk the chance of losing your competitive edge. It’d be very easy for a competitor to come in and steal an idea. I think this is a great idea because first of all, it will eliminate groupthink! If I could give my honest opinion and not feel like I would be fired or reprimanded I think I could generate some ideas that would have at least an ounce of merit. I think for a company to not be burned by this tactic they should post more ambiguous topics for discussion like how focus groups operate. For example, when you’re in a focus group you’re not supposed to know that they want to get at your deep-seated attitudes, the facilitator of the discussion will go about it in a roundabout way to get at those attitudes without revealing the product. I think start-ups can use the same approach to guide the conversation and not explicitly reveal their product or idea. Crowdsourcing can be a source for rich data because people can see the ideas of others and piggyback off of those to create a valuable and viable solution for a firm. It might require a person to really spend some time going through the content, but it should be worthwhile and most people these days love using online tools to get their opinion out about anything and everything. “The more the merrier”, this is what I was thinking when reading the article about crowd sourcing. I agree with Shaun Abrahamson and Peter Ryder, the authors of the article, that a good way to solve a problem is by crowd sourcing, not just externally but internally as well. They described how a contest is about finding the best idea and getting a larger reach from people can help on a situation. Ask them the right questions, the what if questions to get their opinions, I also think its a good idea to leave a blank spot as well, for example when doing a questionnaire or survey always leave a space for extra comments just in case there is something the company is missing or do not have knowledge of. Everything is to help increase understanding. Next motivate people even your own employees. By doing good things, giving them attention, and having them experience some kind of social good, this will help people increase their learning. And still it would not hurt to get more inputs on a situation. Everyone is different and brings a different perspective. I think in terms of promoting your business I would be skeptical to use crowdstorming involving 1000 plus participants. This may be due to the fact that opinions or ideas may go off into tangents not relating to the concept which originally must be met. Having said that, I think on the flip side, crowd storming may be beneficial because having 1000 plus participants generate ideas about a business may add value to the firm or business itself. It may even promote the brand or start up business in the specific market. I would hope that there would be a data analysis or some sort of measure of what type of ideas or concepts are being crowdstormed, because 1000 plus participants seems to be a large number to segment. I do know for a fact that 1000 minds would work better than 10, so obviously there would be 1000 different or similar ideas which can be used to promote or help a business grow or even start up a business or idea. I think that it is very interesting because nowadays building a community around a brand is a key tool for the visibility of a brand. Empowering the customers showing them how important they are can make the customers feeling special and will appreciate the philosophy of the company. It is also great on the media coverage point of view. There is a lot to say about a innovating idea found by a customer. Another point is also about competition. All companies are dreaming of loyal customers because the temptation is all around them, to switch brand. Building this relationship between customers and the brand creates a link and can increase loyalty. I think crowdstorming can be a great tool, especially for newer business as the article described. Working with small business owners I often see how difficult it is for them to get an outside perspective on what they are doing due to living and breathing their business. People love to share what they think, especially when asked for an opinion, so crowdstorming is a great way to gain a different perspective on a business, product or service need/offering, with minimal effort and potential for even overwhelming feedback. I like the suggestion in the article to have respondents help with the decision process by promoting/liking the “best ideas”, so the owner or seeker of information doesn’t get lost swimming in opinions and suggestions. This is an interesting idea. Crowd-storming as a hybrid device of brainstorming, crowd-sourcing, online surveying and focus groups. This could be seen as a useful compilation of several proven techniques to gain valuable customer/segment insight. But is there not value in performing these data collecting/analyzing activities separately? During the beginning steps of the research process, a lot of information must be gathered without filtering. Then it is the responsibility of the researchers to make informed decisions about what specific information will be useful for further analyzing. Is it possible that with crowd-storming, we may be rushing a process that requires a little bit more thought/attention? 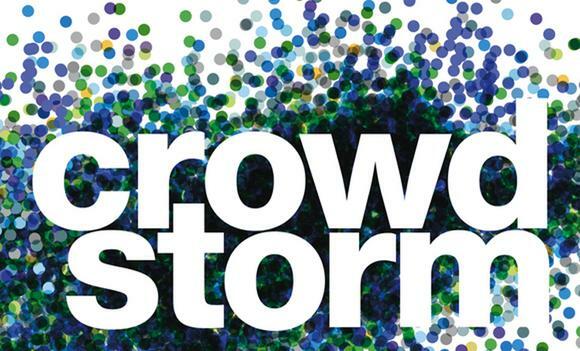 I like the idea of crowdstorming, within certain contexts and limitations. As with any applied method, there are times and situations in which it makes sense to utilize it, and others where it does not. In my MKTG 450 class we discussed customer empowerment in new product development processes. Studies show that consumers love to be a part of things, and the larger the degree of freedom in their involvement, the more favorable their attitudes towards those companies that employ that freedom of involvement tend to be, which in turn favorably affects their purchasing patterns. Brand loyalty is increased through these empowerment tactics as well. However, there are certain types of products where crowdstorming would seem a bit more tricky. Consider those products and services that are largely focused on heavily engineered or technical aspects. Only if you were to crowdsource ideas from lead users of those products and services would it make sense to try to leverage this tool. The average person, who is not heavily consumed or moved by this category of products or services will not have the apt knowledge base and experience to base their opinions, suggestions, and ideas from. When thinking of those instances of crowdsourcing exemplified well in media today, I think about the Crash the Superbowl contest Dorito’s puts on each year. This was the first year the contest went international. The winner of the commercial contest is selected by the public each year, as they vote for their favorites online. The winner of the contest receives $1 million and gets to see their 30 second ad run at the Superbowl and on tv when used by the company in its future marketing. In doing this, Dorito’s gets to see a lot of great ideas come to life from their very own consumers, they increase their promotions and publicity, improve brand loyalty and customer engagement and empowerment, while making some profit all at once. They don’t even have to be involved in the headache that results from the process in careful selection of the contest winner, with consumers selecting the winner for themselves. For consumers, motivation comes from experience, the reward money itself, and getting attention, as the article pointed out. Crowdsourcing is great for creative projects. I can see many reasons for why it works. I feel like this isn’t a new concept and is highly valuable in public relations and marketing. Observational studies, test groups, etc. are perfect examples of crowd storming in a more traditional sense. The internet has provided many new tools for different business practices including this one. I don’t remember if you mentioned whether or not you did something like this for your project? If so, it would be interesting to know what feedback you got. This is a great new concept that helps brands strengthen their customer connections. Especially nowadays building a community around a brand is key for a brand to keep their strong community. Nike is so innovative and has such a loyal customer base it seems like it is just about time until they would pick this up. Empowering the customers showing them how important they are can make the customers feel very special and will make them identify even more with the philosophy of the company. There is a lot to say about a innovating idea found by a customer, another point is also about competition. All companies are dreaming of loyal customers because the temptation is all around them, to switch brand. The higher the switching cost and connection between a firm and a customer the better established is a long lasting connection.